Being from Texas I am a huge fan of Mexican food.Tacos are a main staple in the house. Families around here pass down lots of taco recipes from generation to generation. Though these are delicious after awhile you want to try something a bit different. 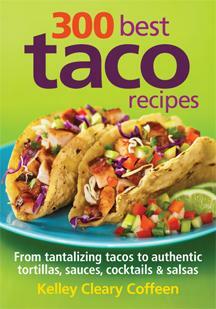 With 300 Best Taco Recipes by Kelly Cleary Coffeen you can really change things up a bit. I received a copy from from Robert Rose for review. I love this book. It is full of traditional as well as new and innovative taco recipes. You don’t have to just stick with beef, beans and cheese with this cook book. 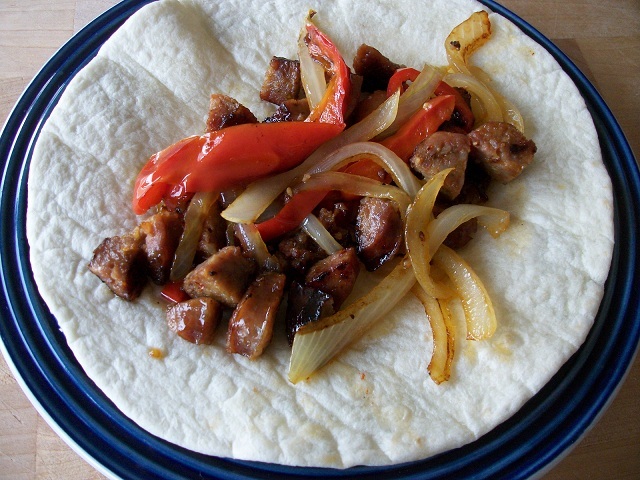 Hubby and I tested out a recipe called “Italian Sausage nd Perr Tacos” I was delighted in how easy it was to prepare. Hubby loved that he got to get involved and use the grill some too. The flavors are incredible. Check out the pic I took of my plate. Yummy. Carmelization of the sausage and peppers was amazing. Love that the book also contains recipes for tortillas, salsas and drinks. MMmm Mucho Sabor. refried beans and 100 different vegetables, cheeses, salsa and sauces. Everything you need to know to make and enjoy a taco can be found in these pages. There’s even a festive cocktail section that reflects the themes and backgrounds of foods f rom Mexico and the West. Ready to buy? Head on over to Robert Rose and get a copy of 300 Best Taco Recipes or some of their other great books.